Welcome to The Bug Geek! Insects! Bugs! Arthropods! Other cool creepy-crawlies! “Photo Friday“, featuring an insect or other arthropod I’ve recently come across during my explorations of nature; this becomes “Forgotten Photo Friday” during the cold winter months when live critters are a little more scarce! A blogroll of other amazing bug/nature bloggers – there’s something for everybody! If you go waaaay back to the early days of this blog, you’ll find that it chronicles my escape from the stifling confines of a federal public service cubicle to The University and graduate school, where I am now pursuing a PhD in Entomology. Posts from 2008-2009 largely focus on the steps I took to get into the grad school of my dreams, interspersed with a lot of ranting about my job at the time (in the interests of privacy, most of the ranting-type posts are now password protected. If you would really like to read them, contact me). Please stick around, read a bit, comment lots, and suggest links I could add to my blogroll or Entomology link page. Thanks for stopping by! P.S. You may have previously known this blog by its original name, “Fall to Climb”. 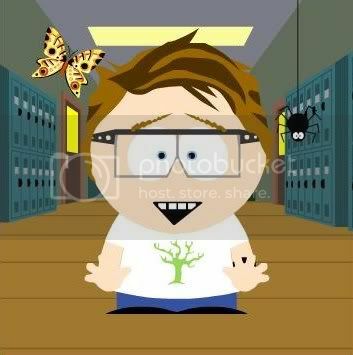 I changed the domain name to http://www.thebuggeek.com in November of 2011, to better reflect the content and focus of the material – things changed a lot since this blog’s inception in 2008! I’m interested. Am still not sure if I want to return to school after all these years. Would love to see your experience. Well, stick around…I’ll be blogging about the whole thing for a while yet (I’m just getting started!) It’s definitely a life-changing decision, and not for everyone, but I’m very happy with the path I’m on and excited about what the future holds. Thanks for stopping by and commenting, Katie! I just found your blog today and I love it! I’m an almost-finished- Ph.D. student with an insect blog, so I’m adding you to my blogroll. Keep up the good work! I spent 5 years working in the real world after getting my BS in Entomology and before going on to graduate studies. I think a break between degrees is a good thing – at least it concentrated my mind. But then somehow I ended up as an acarologist – so be careful (and good luck with the beetles).